I love making ice cream. Aside from this chocolate cherry combination, my other favorite is chocolate peanut butter ice cream with nutella and oreos mixed in. Hmm... I think I'm going to need to make that again soon... It's such a fun treat to make from scratch and easy enough that the kids can be involved too-which for them, making ice cream is a pretty exciting thing. +About five minutes before you take the ice cream out of the ice cream maker, add in the drained, chopped, sweet dark cherries (mine were in a can that you can find near the canned fruit section at the store). Make sure the cherries are completely mixed in. +Serve immediately or freeze. I always put mine in the freezer for a few hours before serving so it's not as soft. 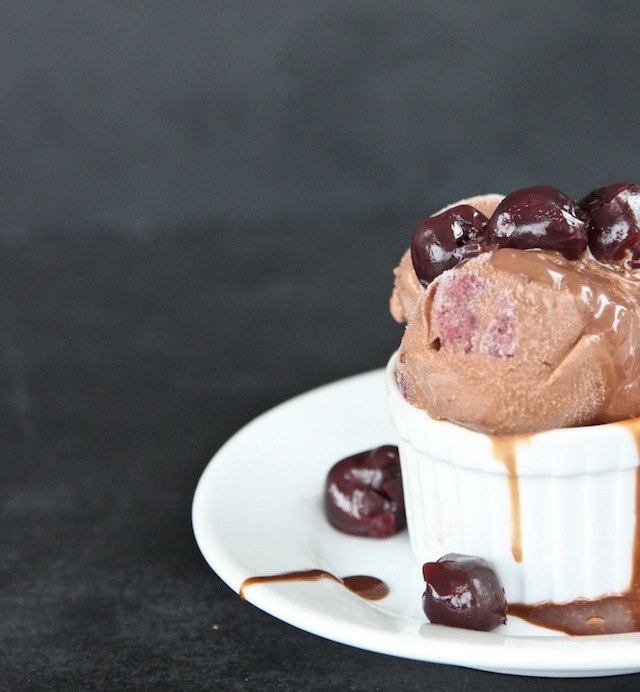 +Serve with leftover cherries and melted milk chocolate drizzled on top. Yummy yummy!